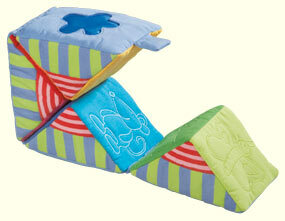 The soft flip-flap triangles are a delight for baby's hands, eyes and ears as they rattle, rustle and squeak! With optical effect foil and magnetic fastner. Made of cotton/polyester. Measures 6" x 6" x 4".